What do you do when you have an assortment of special beads that you finally have decided to use? Stringing up a necklace of disparate beads to achieve an attractive result is no easy feat. 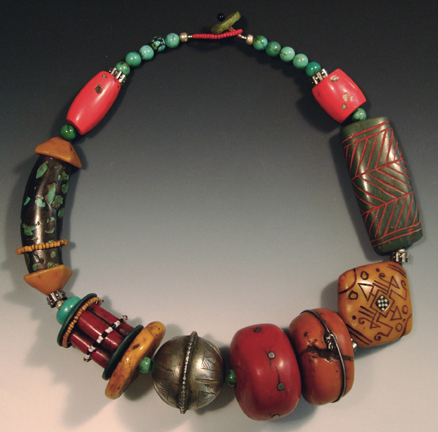 Yet, Victoria Hughes makes it look simple in this short, recently assembled sampler necklace that combines polymer with bits and pieces of other materials. Often items of jewelry have a decided focal point which highlights a particular section of the piece. In Tory’s necklace there is no single focal point and the center is a held by small turquoise bead. Since this is a piece comprised of many unique beads, the crucial compositional issue is how to feature each distinctive component without overwhelming the others and still keep the whole cohesive. A repetitive use of color combined with an asymmetric balance of shapes is the foundation of Tory’s solution.The arrangement of color is fairly straight forward. Various shades of coral red appear regularly throughout the necklace. Although it is less dominant, the lighter value and warmth of the recurring amber hue draws the eye away from the red tones and sets up an asymmetric balance of warm color. Cooler spots of turquoise also show at intervals, but they are secondary in importance to the rhythms of red and amber. In addition there are some neutral metallic elements, as well as the unique presence of a dark olive green and a more persimmon toned red-orange. As different as it might first seem, the olive green faux jade is not too far in value from the darker mix of the opposite turquoise and black tube bead and the oxidized silver round in front. 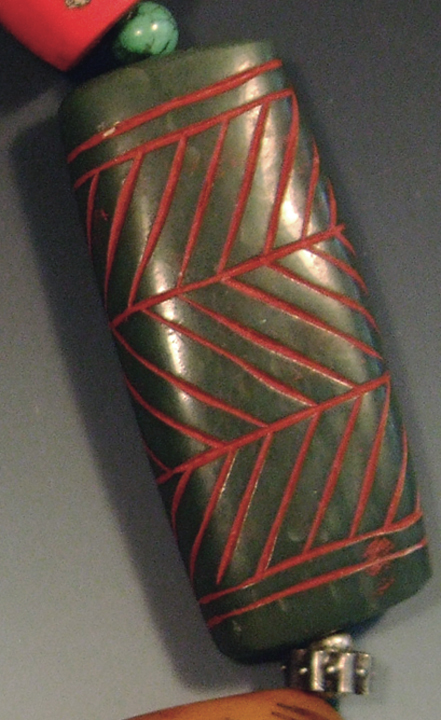 Moreover, the decidedly warmer hue of the olive green relates to the amber tones, while the incised lines highlighted with red pigment connect it to the other red beads. 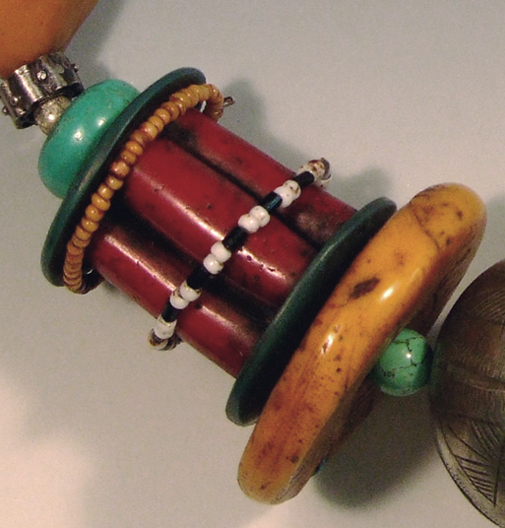 The large, persimmon colored bead with the wire wrap is both visually and physically in between the coral red and the amber hued beads. Silver wire and distressed black accents break up the body of the color and again tie it back to other elements of the necklace. Tory’s balance of shapes is also asymmetric. The three large beads at the front are all fairly simple. They function well as a unit of three since each one is a variation of a banded round form. The studded bead, which exhibits an implied mid line, hangs in between two beads with true mid line markers. On the left, the silver bead, with its subtle surface pattern and metallic gleam, counter balances the other two rounds which are warmer hued, but have a simpler surface. At either end of this central trio are examples of far more detailed beads. The diamond bead on the right is an uncomplicated shape but it displays an intricately carved surface that immediately attracts the eye. Part of this visual draw is the dark linear pattern of incised pattern which stands out against the warmth of the light toned amber. On the other side, the fanciful barrel bead presents lots of small parts but not much actual surface complexity. However, its more intricate arrangement of forms balances well with the visually interesting surface of the diamond bead. These two beads also are also connected through their sharp black and white accents: a wrap around strand of seed beads the on the left and an inlay checkerboard on the right. 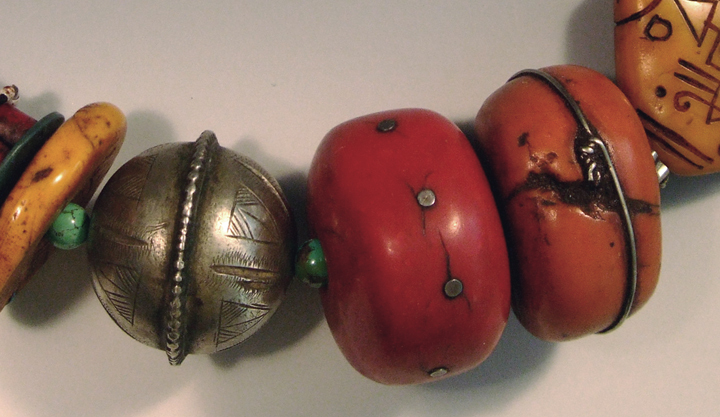 Next to these two disparate and unusual beads is a pair of oblong beads. Although they are unmatched, they both are rectangular and about the same size. The faux jade bead on the right has a decidedly more ornamental carved surface that is highlighted in red. 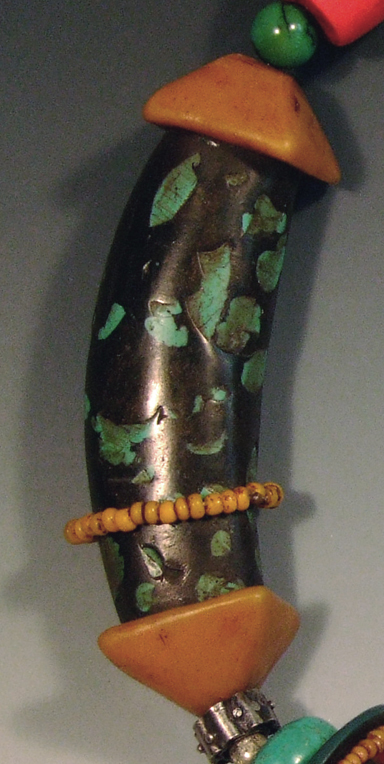 Its visual opposite, a faux turquoise bead, features the mottled effect of natural stone, a belt of seed beads and a pair of amber, pyramid-shaped bead caps. 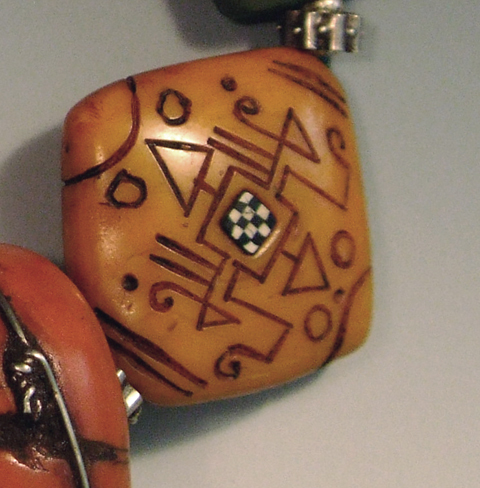 Again, the multiple parts of this bead along with the all important detail of the amber seed bead girdle, which visually breaks up the darker bead and echoes the linear carving on the “jade”, creates an asymmetric balance. The necklace ends with a mostly symmetric diminishment of scale that uses a pair of slightly mismatched bright coral beads, a run of five turquoise beads and then a toggle style clasp. Remember that once the necklace is put on, the sequence from the two bright coral beads to the clasp will be at the back of the neck and therefore commands less attention.Hopefully, the “how” and “why” of Tory’s asymmetric compositional success is more transparent after examining the individual parts of this necklace. One can see how the beads are unique but relate in various ways to the other beads through a delicate balance of color and form. Overall, the right side of the necklace is a bit stronger due to its complicated surfaces and greater visual mass, but this is offset well by the complexity of the beads on the left and one’s attention to all the interesting, small component parts. And in the end, the bits of turquoise and silver throughout the whole are crucial to holding it all together.